NOTE - Tree seedlings, grafts and planting expenses are tax deductible—up to $10,000 per year (For more information visit www.fs.fed.us/spf/coop/programs/loa/tax.shtml.). These PDF files are text-searchable. You may download Adobe Reader here. What are genetically superior black cherry trees? These trees are the result of selecting trees that show superior form and growth rate, and are less likely to possess gum defects. Historically, the best black cherry originates in Pennsylvania and New York. Our trees are from these areas. Scion wood, or bud wood, from these genetically superior trees is grafted onto black cherry root stock and then planted in research plots. Superior cultivars are then selected. What are the main differences between the improved seedlings and the grafted trees? The grafted trees are genetically identical clones of the parent cultivars described above. The superior seedlings are grown from the seeds of these trees. The seedlings will vary somewhat from their parent trees, but should still be genetically capable of growing faster and straighter than seedlings from common black cherry trees. Are the genetically superior black cherry trees really that much better than common seedlings? Because desirable traits such as growth rate and form are inheritable to some degree, selecting trees that are superior in this regard and then selecting trees by the same criteria from successive generations produces a tree that is superior to common seedlings with inferior parents. After just four years of growth, some of our cherry trees are 3½ inches in diameter and 18 feet tall. Will the genetically superior black cherry trees grow and survive in my area? Black cherry is native from northern Florida to Minnesota and west to Texas, Oklahoma and the Dakotas. It grows well in these areas where there is fertile, well-drained soil with adequate moisture. This is a common defect in cherry. At this point, it is not known what causes the defect. Research has shown possible causes are boring insects, genetics and burning of pastures and forests where cherry are growing. We are closely following research by the U.S. Forest Service and hope to have an answer in the future. Our current selections are coming from areas with a limited amount of gum defects and from trees which show little, if any, gum defects. These areas are also where the highest value cherry trees in the nation have been harvested. Will the trees grow well several hundred miles from where they originated? Our experience has been that as long as soil, nutrient and water requirements are met, these trees will do well in a very large geographical area. Should I consider wind when selecting a site on which to plant black cherry trees? Yes. Black cherry has a shallow fibrous root system and is somewhat brittle. Therefore, a site that is protected from wind is desirable. The protection could be in the form of an overgrown fence row, a wooded area, or some type of geographical configuration. If you do not have any of these, a windbreak could be planted relatively easily and economically. We recommend windbreaks on all plantations if possible. We also believe cherry plantations interplanted with poplars can provide excellent wind protection and help to improve the form of the cherry trees. What are genetically superior black walnut trees? These trees are the result of decades of research by a forest geneticist from a leading Midwestern university. Originally, scion wood, or bud wood, was collected from over 400 black walnut trees throughout the Midwest that had superior form. Through a selection process using form and growth rate as criteria, the geneticist determined the most superior trees. Over the years, through genetic selection of successive generations, trees with increased growth rate, vigor and vitality have been developed while maintaining superior form. The two most famous cultivars patented by the university are Purdue Number One and Tippecanoe Number One. The grafted trees are genetically identical clones of the parent cultivars described above. The superior seedlings are grown from the nuts of these trees as well as the original Purdue Number One cultivars. As such, the seedlings will vary somewhat from their parent trees but will still possess better genetics than common seedlings. Is the genetically superior walnut tree cultivar really that much better than common seedlings? The forest geneticist who developed the genetically superior trees estimates that only a fraction of 1% of seedlings from common black walnut trees will have the same growth and form characteristics as the genetically superior trees. Even when given the best care, maybe 10% will produce veneer-quality wood, but only after a period of 50-60 years or more. Results from our planting of superior seedlings show that at least 60% should make veneer grade with proper care. Except for those damaged by outside forces (lightning, wind), virtually all of the grafted trees should be veneer grade if given proper care. How big are the genetically superior black walnut trees? Sizes are listed on order form – sizes vary from crop year to crop year. Will the genetically superior black walnut trees grow in my area and survive? The natural range of the eastern black walnut tree (Juglans nigra) is from southern Ontario to Texas and Alabama and from Nebraska to the Atlantic Ocean. 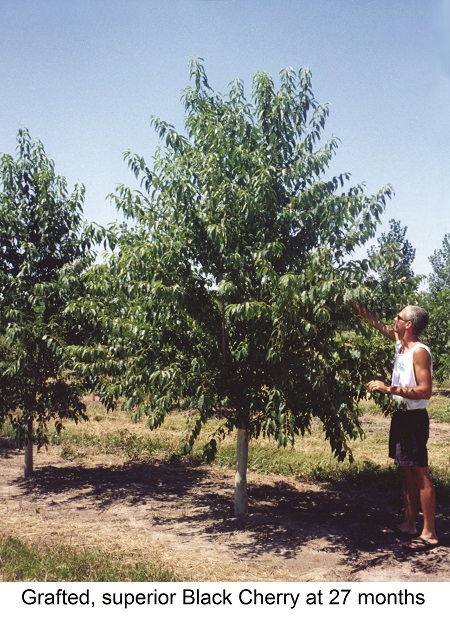 However, genetically superior walnut trees have been planted in Florida, New England, Michigan’s upper peninsula, Idaho and even on the west coast. What type of root system do they have? They have a deep tap root system. *White Oak - 9-12 ft, #25 container are the same Genetically Superior White Oak trees we sell bareroot in large quantities for Investment Timber except they are grown larger and sold in containers more convenient for landscaping purposes. We are continuing research on superior White Oak grafted trees. The parent trees show superior form and speed of growth. We have a limited supply available at this time. We are grafting these onto Bur Oak rootstock, which grows in a wider range of soils than standard White Oak. They can be planted on heavy clay soils and in moist areas. Annual growth rates up to 0.8 caliper inch average have been experienced in some early plantings. We now have seedling production available from our best performing grafted White Oak trees. These are suitable for plant hardiness in zones 4-7. These seedlings will grow best on soils in the native White Oak range which can vary from rich, well drained, flat soils to rolling clay soils with good surface drainage. 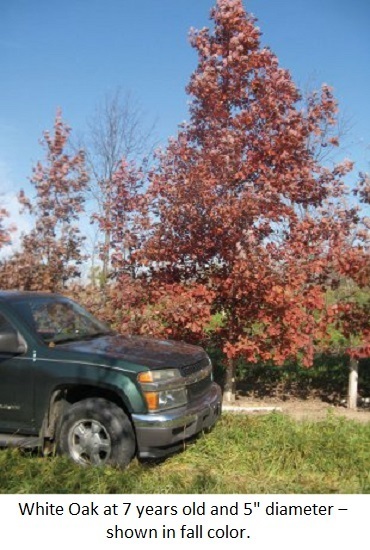 Do not plant White Oak seedlings on flat, heavy, wet clay sites or high PH alkaline sites. 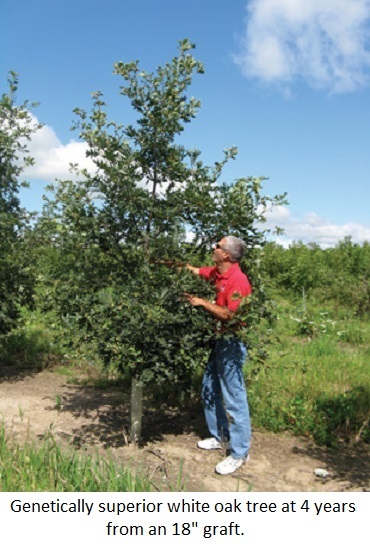 Use the grafted White Oak on Bur Oak rootstock in these conditions. 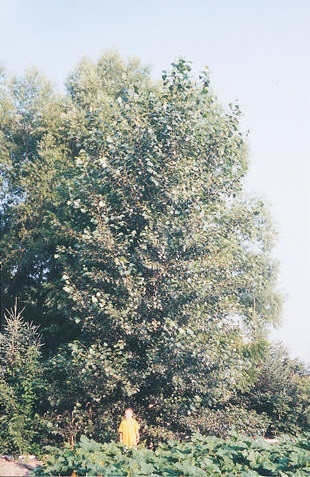 Curly Poplar is a cross of Populus canescans with Populus alba. The fast growing Curly Poplar produces an attractive highly figured wood grain that makes it valuable as veneer. This tree was discovered as a naturally occurring mutated sprout of an un-named poplar tree that grew in a cultivated area in Maryland. The original plant was cultivated by Mr. Sam Grober in his yard in Evanston, Illinois and researched by Dr. Rick Meilan at Purdue University in West Lafayette, IN. Curly Poplar trees have an upright trunk and a round crown. They can reach 65 ft. tall at maturity with high, distinct branches. 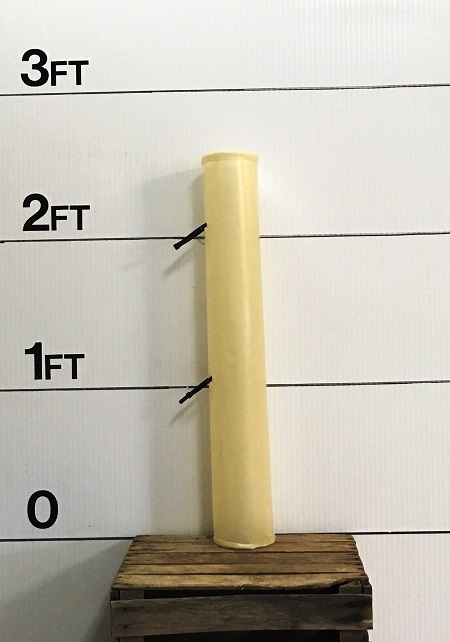 Curly Poplar is patented by Purdue University and all propogation is prohibited without express authorization form Purdue Research Foundation. Click here to read the full story of Sam Grober and Figured Poplar. Incredibly fast with ample moisture and weed control, 6-8 ft. the first year is possible. Annual growth rates of 1 inch caliper or more are expected, making harvest in 20 years or less possible. 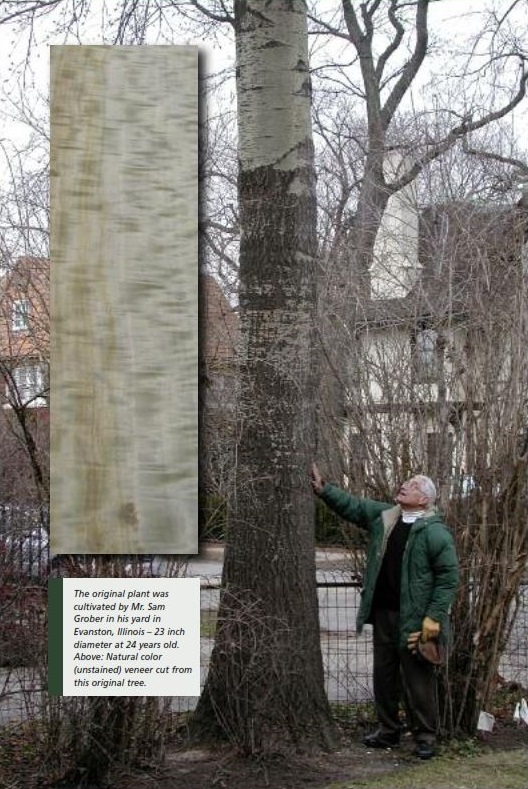 The mother tree at Evanston Illinois, was 23 inches in diameter and 65 ft. tall at 24 years old. What is the potential value of Curly Poplar? It has been estimated that Curly Poplar veneer logs could be worth as much as Oak, Cherry or Walnut because of the figured pattern in the wood. Using recent prices, this gives a 24 inch diameter log 16 ft. long a value range of $460 to $1,380 or more. The tree pictured on page 14 was 23 inches in diameter at 24 years old. We believe with proper care and a little fertilizer these Curly Poplar trees could grow to this size in 20 years or less. What plant spacing should be used for curly Poplar? Current research shows a 15 x 20 ft. spacing (140 trees per acre) should be a good spacing. This is similar to the spacing used in walnut and cherry plantings. 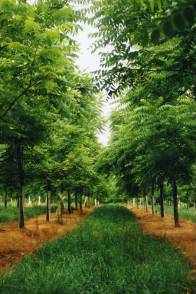 You may also consider using Curly Poplar as a windbreak for walnut and cherry plantations. For windbreaks space trees 12-15 ft. apart in 1 or 2 rows around you plantation. This could provide for a valuable harvest 10 years or more ahead of the walnut and cherry trees and provide wind protection the first 15 years—when it is most needed in these plantations. What type of soil conditions will Curly Poplar grow in? Curly Poplar will grow in a wide range of soil conditions, from moist soils that occasionally flood to heavy clay soils with high water tables. We have trees that are growing where water was standing 6 inches deep for 2-3 weeks at a time around the trees. Where will Curly Poplar grow? They will grow in plant hardiness zones 4 through 7 with at least an average annual rainfall of 30 inches per year. The Curly Poplar may grow in zone 8 and possibly 9 based on the natural range of both parent species. Further testing on range continues at this time. Fast growing poplars for interplanting and permanent windbreaks around plantations so ideal for black cherry plantings and the perimeter of black walnut plantings. Protects trees from spray, wind and animals. Use tree guards on all Genetically Superior Investment Timber Trees (not recommended for use with ornamental trees). We do not supply stakes. 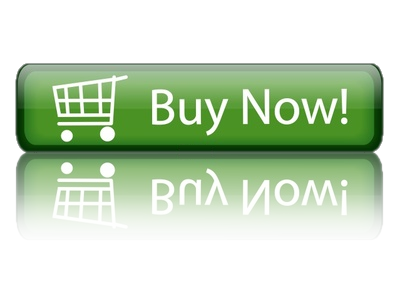 We recommend ¾ in. x 10 ft. galvanized EMT conduit available at most building supply outlets for the 48 in. tubes and ½ in. x 5 ft. EMT conduit for the 30 in. tubes. Note: 24 inch white spiral tree/spray guards wrap around tree trunks to pre­vent sun scald and mouse dam­age; they are typically used with ornamental trees, not Investment Timber. Copyright 1994 to Present John L. Neidigh. All Rights Reserved.